We have a lot of content today, kids, so let’s get started. I want to begin by going off-uni and telling you about some of my November travels, beginning with the trip I took down to Virginia a few weeks ago with my friend Carrie (the Tugboat Captain recently started a new job and couldn’t take time off). 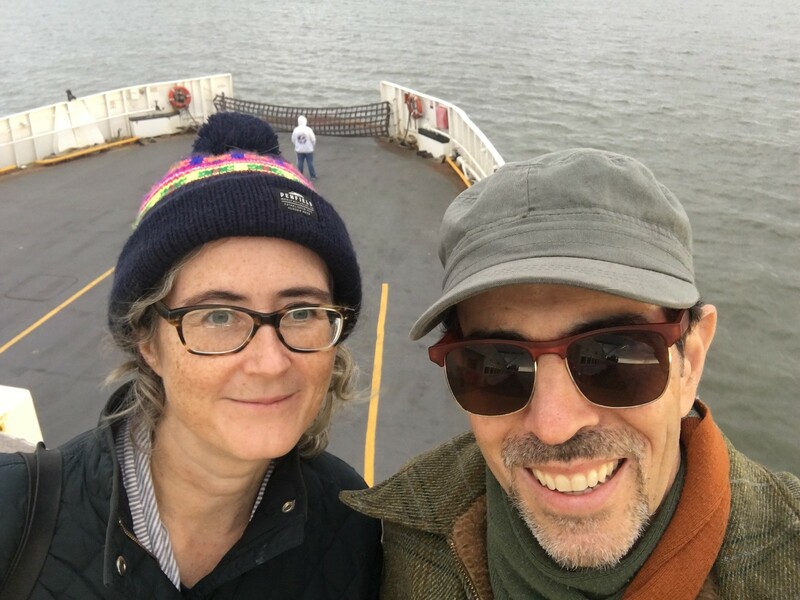 That’s me and Carrie shown above, aboard the Cape May car ferry, which took us from New Jersey to Delaware. Let me digress for a second to say that I’ve been eating oysters my whole life. Not only that, but my hometown is the Long Island village of Blue Point, which is the namesake of the bluepoint oyster, so I have oyster brine in my blood, or something like that. 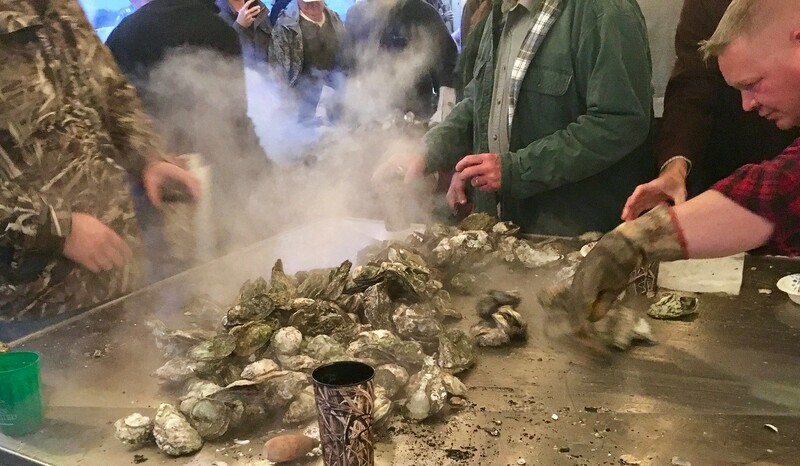 I was both intrigued and somewhat wary about the oyster roast — intrigued because I’d never had roasted oysters before, and wary because (a) I’ve found that I usually prefer cold-water oysters from more northerly regions, and (b) I thought that the event might be somewhat hoity toity, with lots of wine pairings and stuff like that. 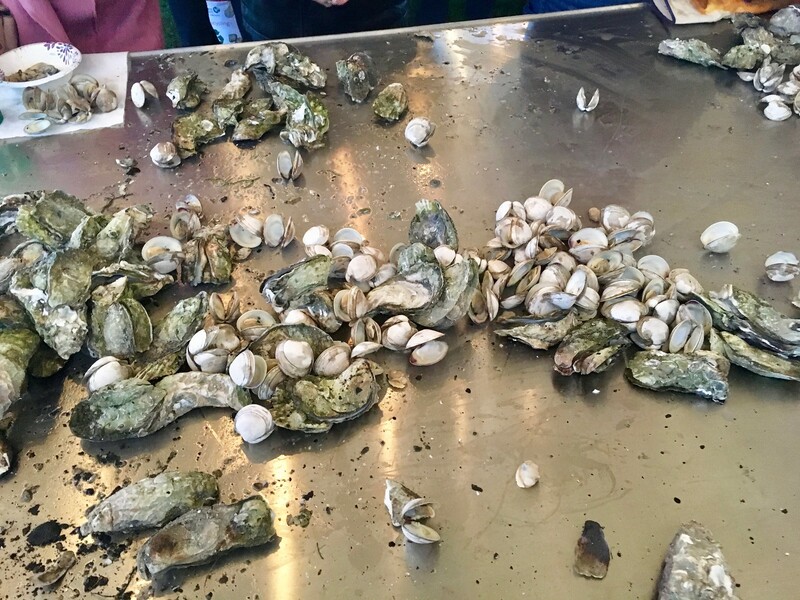 The day before the roast, we had lunch at a place that offered raw oysters — a local variety called seasides. I ordered some, along with some excellent hush puppies, and was pleasantly surprised. They were plenty briny, and not as mild as other warm-water oysters I’ve had. 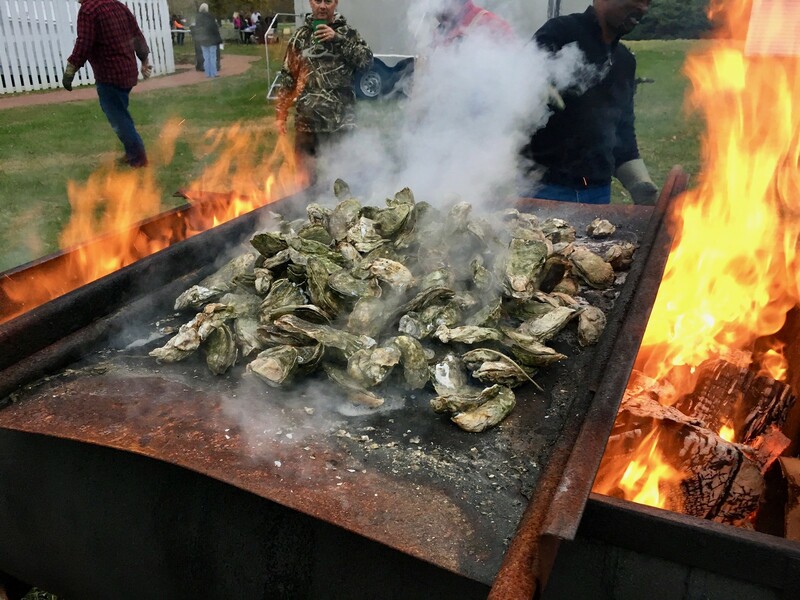 I figured if the oysters at the roast were anything like this, I’d be very happy indeed. The crew periodically checked the oysters to see if they were done. 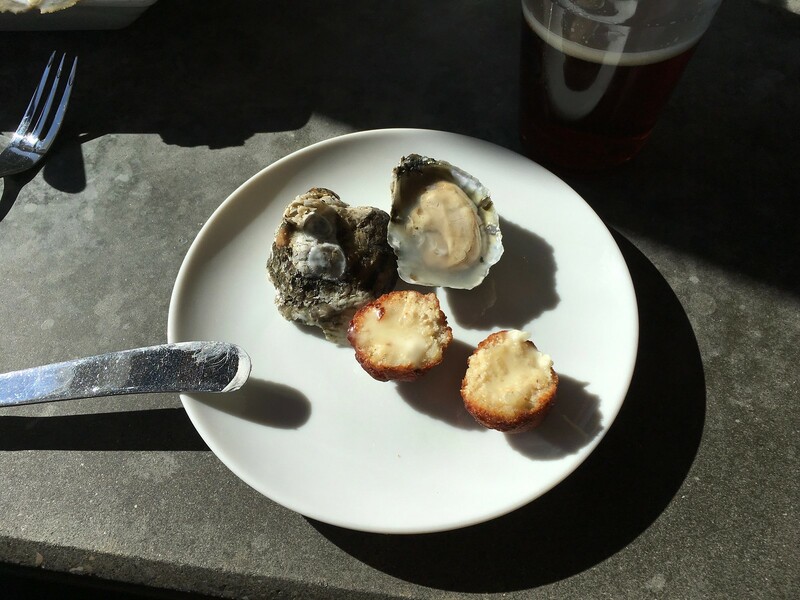 It was a bit of a judgment call, because the oysters didn’t open up wide like cooked clams or mussels. Some of them cracked open a bit, though, and that’s apparently enough to know when they’re done. 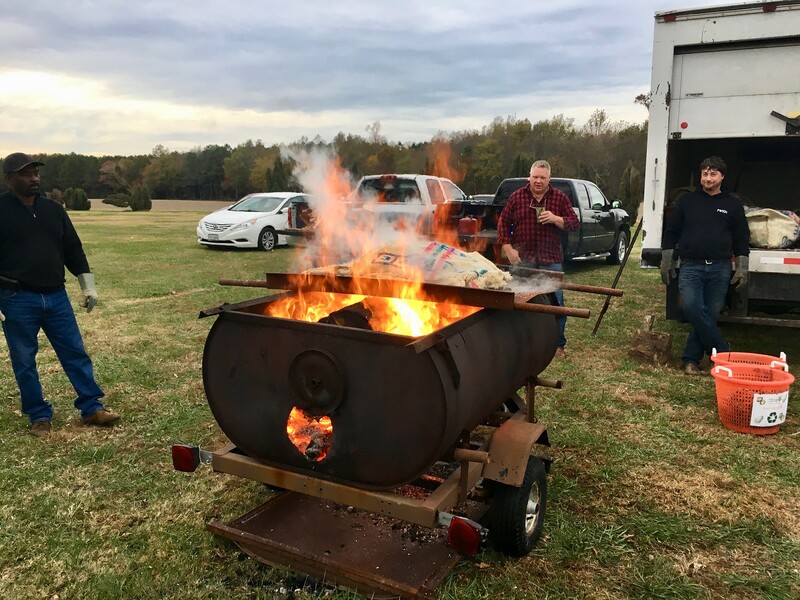 The crew said the total cooking time was about 15 minutes. And then everyone just dug in. With their bare hands. Simple as that! 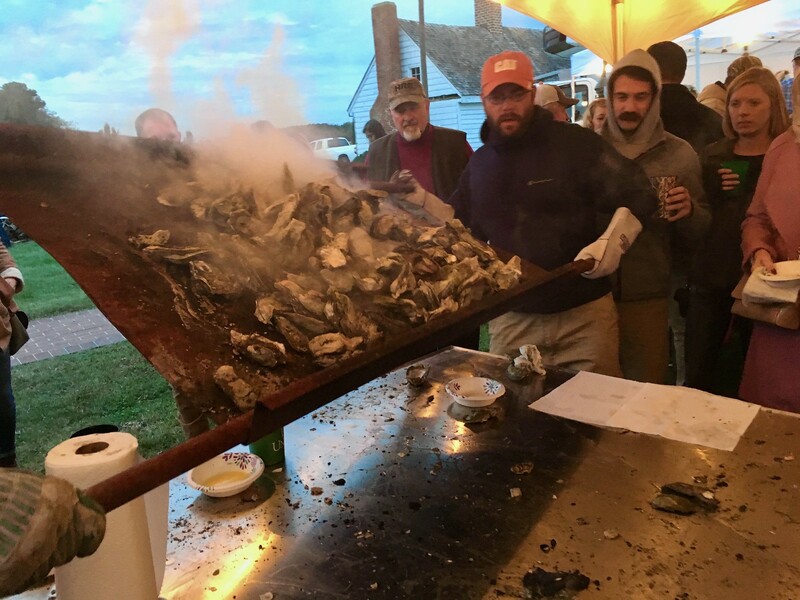 No chairs, no utensils — just a bunch of people standing outside, shoulder to shoulder, reaching in for a few more oysters and devouring them. So much for hoity toity! It was an amazing scene — strangers yakking, everyone smiling and laughing. 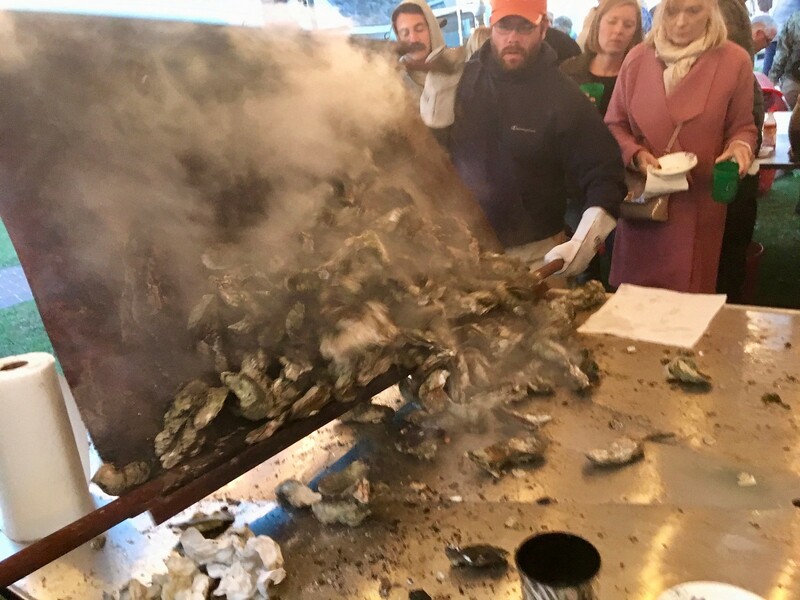 When we plowed through one batch of oysters, they’d bring us some more. Unlimited beer and wine, too. A very convivial event. Sorry I don’t have photos of people chowing down, but my hands were too dirty to handle my phone. Some of the oysters had cracked open a bit and were fairly easy to pry apart. Others hadn’t cracked at all, so those had to be shucked (we brought along oyster knives for that), although they didn’t put up nearly as much resistance as a live oyster would. Pretty easy work. As for the flavor, it was interesting. 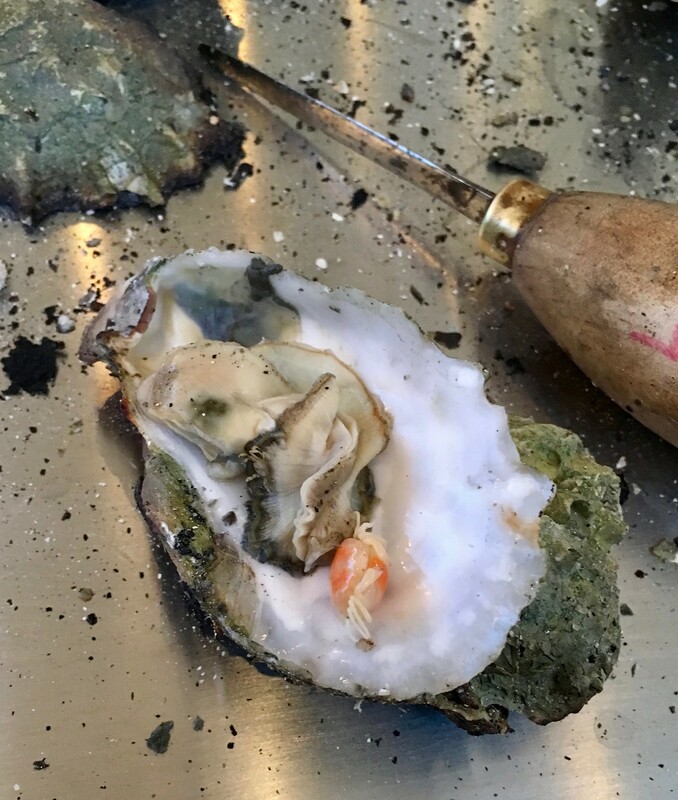 There was very little of the brininess that I’d experienced in the raw oysters we’d eaten the day before — the cooking process had removed most of that. 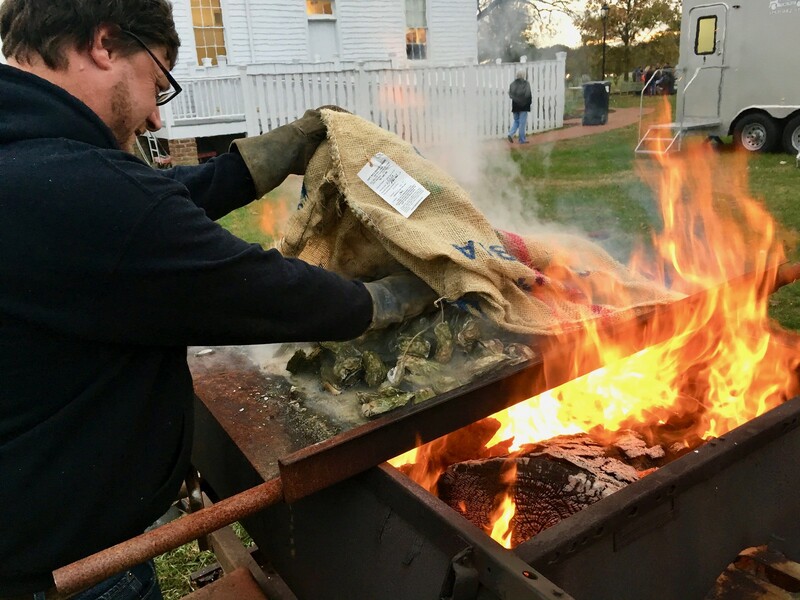 They were a bit more like steamed clams, but bigger, heartier, and, well, more oyster-y, with a roasty undertone of char from the fire. Good stuff! Victor and Betty had told me to watch for these. They’re called pea crabs — little crabs that live inside the oysters. 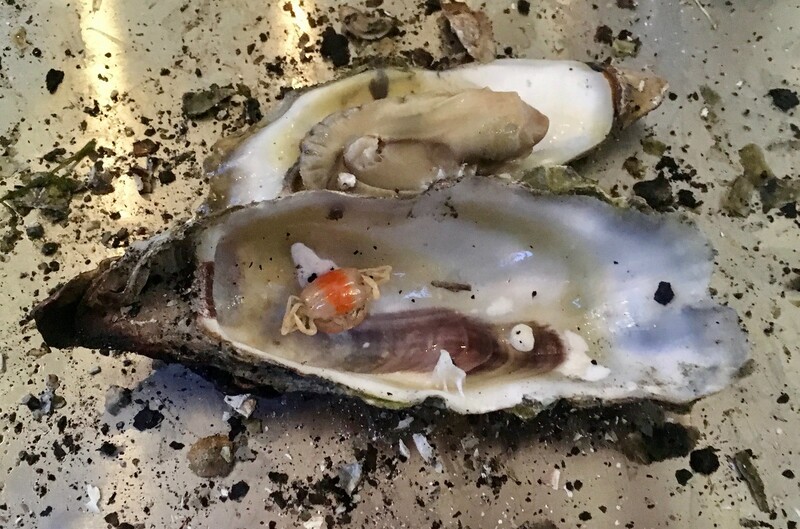 Technically speaking, they’re parasites, because they feed off of the oyster’s food intake and don’t give any benefit back, but they don’t harm the oysters. In a lifetime of oyster eating, I had never encountered them or even heard of them. 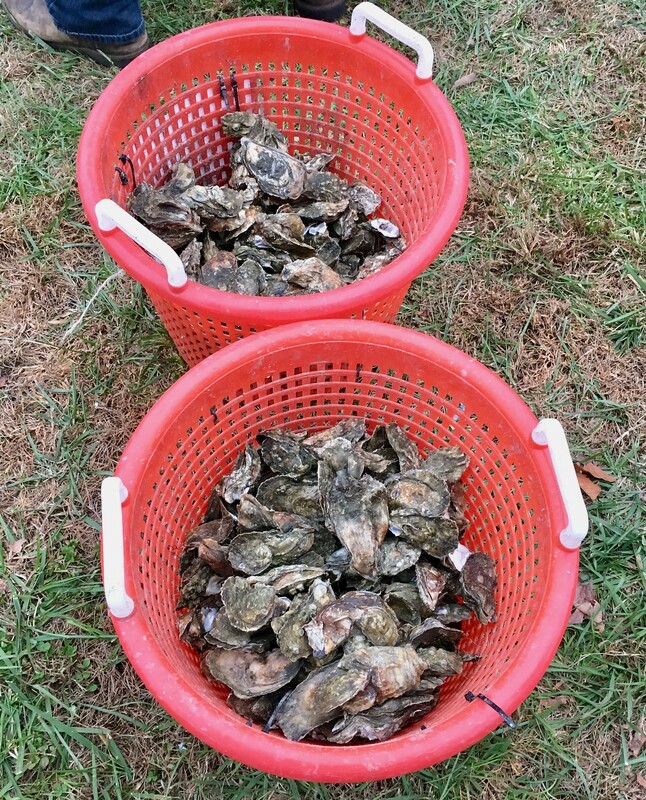 They’re apparently much more common in warmer waters and in wild, non-farmed oysters, and restaurants routinely discard them when they turn up during shucking. Those three factors help explain why I haven’t seen them before. And there’s still more! 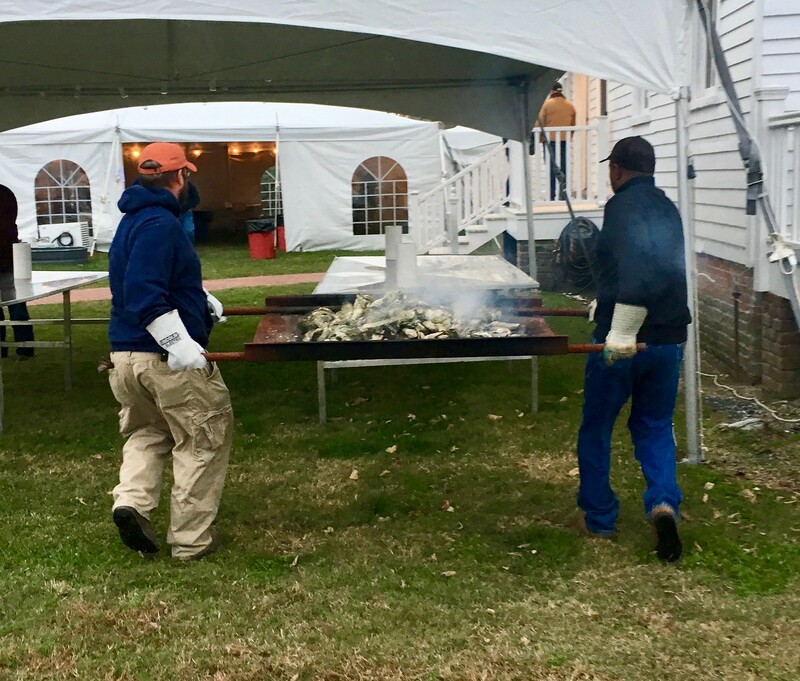 For people who didn’t like oysters and/or didn’t want to stand around (or were just gluttonous, like me), there was a separate tent with tables and chairs and a big buffet line featuring chopped pork barbecue, grilled chicken, and lots of side dishes. Man-oh-boy, what a feast. Sorry, no photos of the ’cue. And the price for all of this fun? Only $60. A total bargain, and you can bet I’ll be going back next year. We high-tailed it back home the next day. Not really a road trip, because we didn’t make any fun stops, but it was still a swell getaway. And I’m now sightly obsessed with pea crabs, which I want to learn more about. 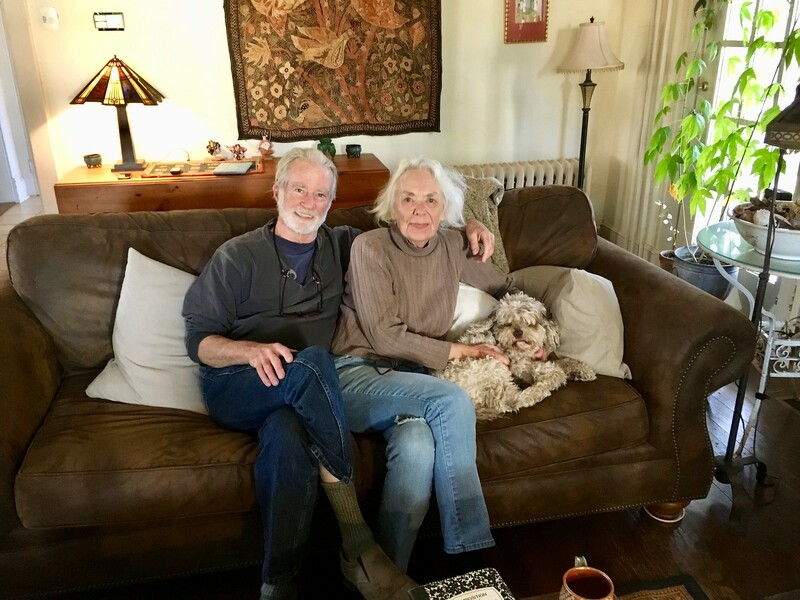 I was home for just a couple of days before it was time to hit the road again on the day before Thanksgiving. That’s when the Tugboat Captain and I drove up to Ithaca, N.Y., where we spent the holiday with her brother and sis-in-law. This was more of a road trip, as we made several fun stops along the way. 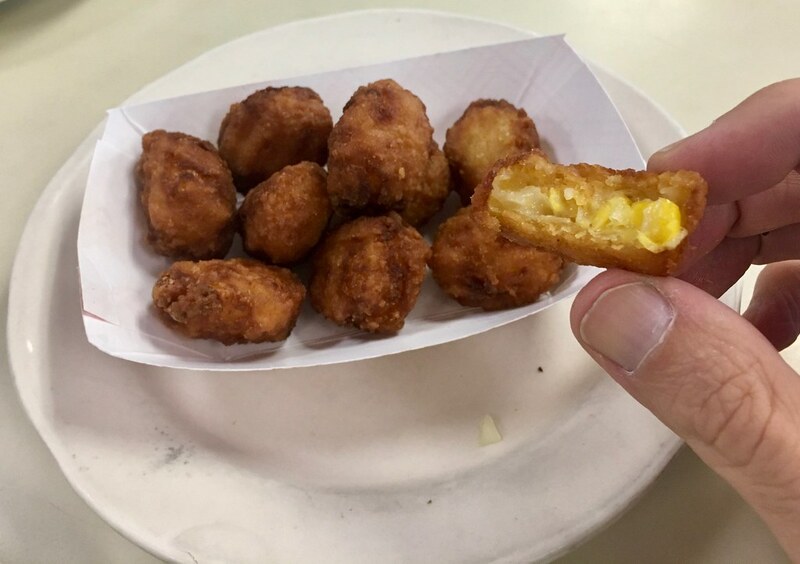 We ordered some hot dogs (disappointing) and pierogi (pretty good), but what really impressed me were the corn fritters, which had real corn niblets inside. Tasty! 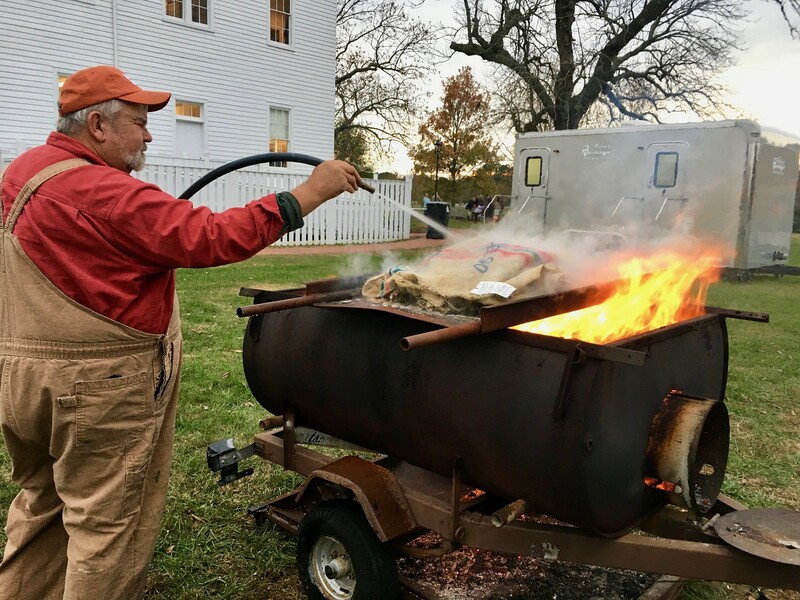 Thanksgiving itself was fun, with lots of interesting cooking projects, but I’ll cover that in an upcoming segment of “Culinary Corner.” For now, let’s skip ahead to the day after Thanksgiving. 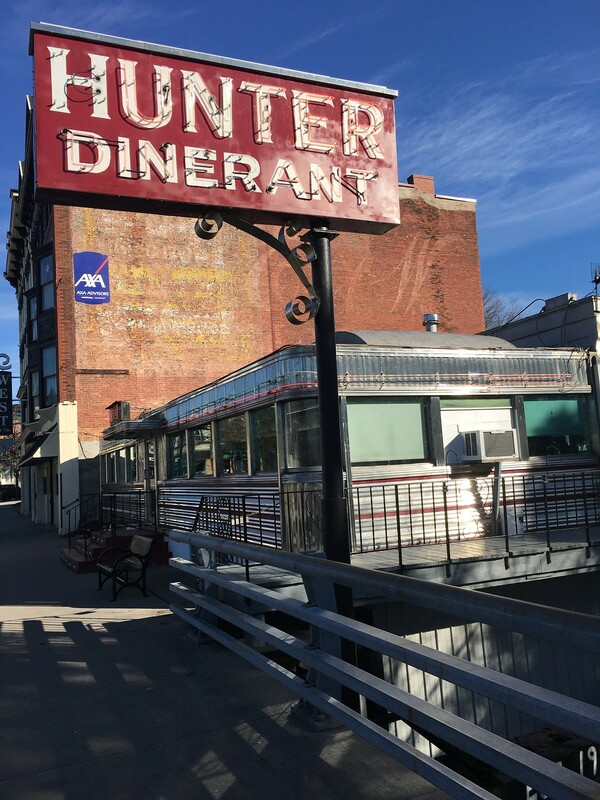 And therein lies a Uni Watch tale: Two years ago I posted a travelogue about an upstate road trip, which prompted reader Chris S. to say, “Next time you come upstate, you should check out Hunter’s Dinerant in downtown Auburn. 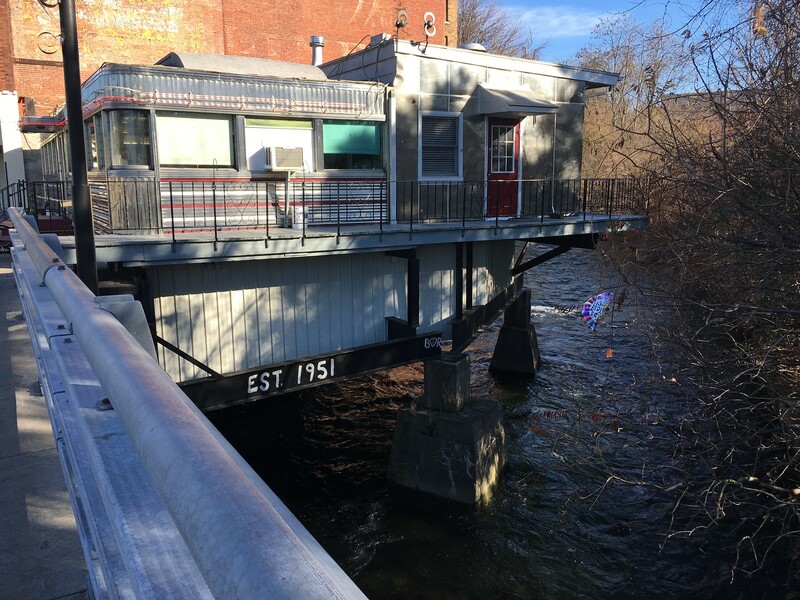 Classic diner overlooking a river.” I filed that away, and on Friday we drove up to Auburn for breakfast. 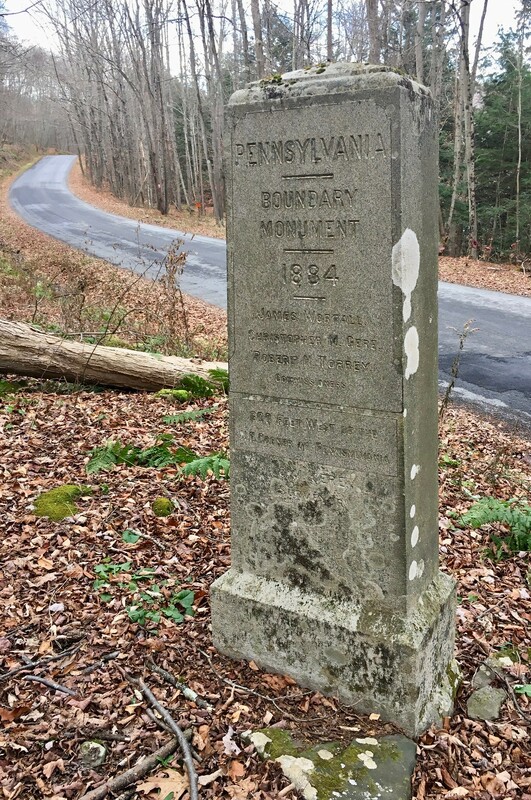 I love that the road is called Penn York Road. Actually, I love everything about the obelisk. So different from the usual “Welcome to [wherever]!” signs that usually punctuate a state border crossing. After that, we headed home. I don’t have any December travels on the agenda, but these two November trips should hold me for a while. Thanks for listening. 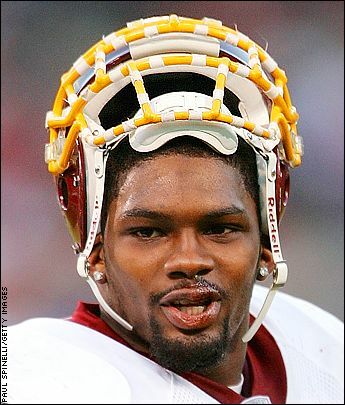 Tape-estry: Yesterday was the 10th anniversary of former Washington defensive back Sean Taylor’s death, so Ravens safety Tony Jefferson honored him by taping up his facemask, just like Taylor used to do, for last night’s game against the Texans. As you can see above, Jefferson also went with a striped waistband towel (or is that the end of his belt?) and striped socks (although his hosiery hijinks were paltry compared to what Taylor used to do). If you look closely, you can see that Jefferson was also wearing a gold necklace, which presumably had nothing to with Taylor, but I’m always amazed to see a football player wearing something like that. Seems like it would be easy for it to get yanked off or dislodged during a play. This isn’t the first time an NFL defensive back has saluted Taylor with facemask tape. Colts safety LaRon Landry did the same thing for at least two games in 2014. Air Coryell is on full display in this 1980s Chargers promotional poster from your friends at Imperial Savings, “Where Tomorrow Begins Today.” There’s quarterback Dan Fouts, tight end Kellen Winslow, and of course coach Don Coryell, whose frown floating down from the lightning-charged skies invokes some type of all-powerful being. • Got a few more Chargers items for you: DeLong made this terrific-looking zip-front pullover. … This is a nice-looking Chargers sweater. … And we have a 1970s Chargers helmet bank here, in the usual design from WDW. • Here’s a really nice-looking Packers varsity jacket from DeLong. It has a patch for Super Bowls I and II, so this one was sold prior to the 1997 win over the Patriots. • Swingster was the maker of this 1980s red satin Detroit Red Wings jacket. Logo on the front, plain block “Red Wings” on the back. • Kansas City Chiefs fans, you’ll play a faultless game of golf with these 1970s Chiefs golf balls made by Faultless, of course. • This brass belt buckle commemorated Major League Baseball’s 79th Annual Winter Meetings. • Never seen these before: Could these 1980s-ish NFL helmet magnets be DIY? 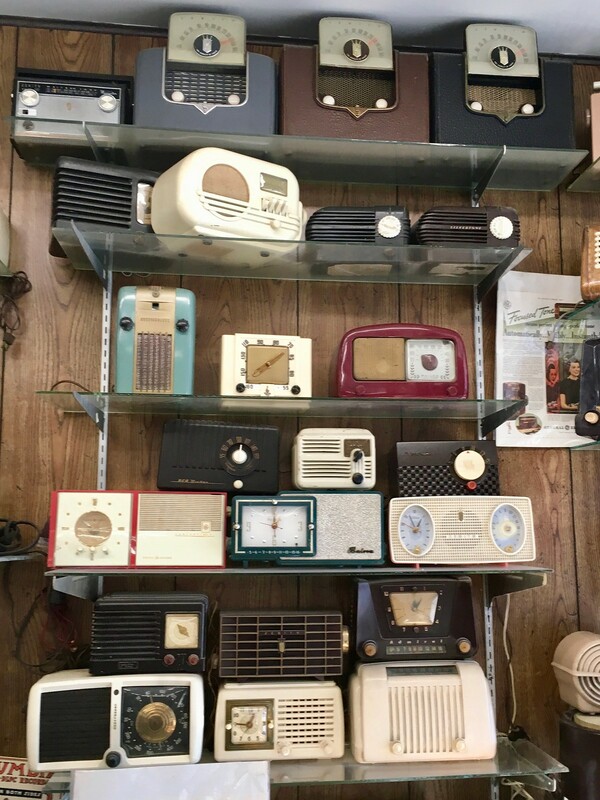 • Ever seen one of these? A 1960s NFL game model kit from Aurora. Although the model was issued long before Joe Cool’s time, I’d swear the Bears quarterback looks like Montana. Curious how the teams have the right uniforms yet no helmet logos are shown. • Cool box artwork for these 1970s NBA “Playmaker” shoes. These were “Official NBA Athletic Footwear” and sold for … 88 cents? I’m pretty sure no players wore these in games. 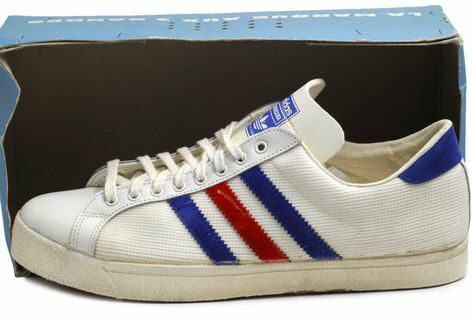 Funny how there’s no maker’s mark anywhere — these were a direct rip-off of the famous Adidas “Samba” indoor soccer shoe. Funny how that could happen, given that Adidas had the official shoe of the ABA at the time. • Maybe those shoes were made by Kinney? If so, here’s the NBA-branded bag they came in. Time machine: Former Uni Watch Ticker assistant Mike Chamernik has a website where he catalogs the archives of his favorite ESPN writers, including Zach Lowe, Sam Miller, and, now, me. So far he’s only gone back as far as my 2013 columns, but he says he plans to add the rest (another nine years’ worth) when he has time. For those who’ve been frustrated by ESPN’s haphazard website archiving, Mike’s work is a godsend. Thanks, buddy! Sign here: Some of you have expressed interest in having me and/or Phil sign your Uni Watch mini-helmets. We’re both happy to do that. I even bought a green Sharpie for the occasion! 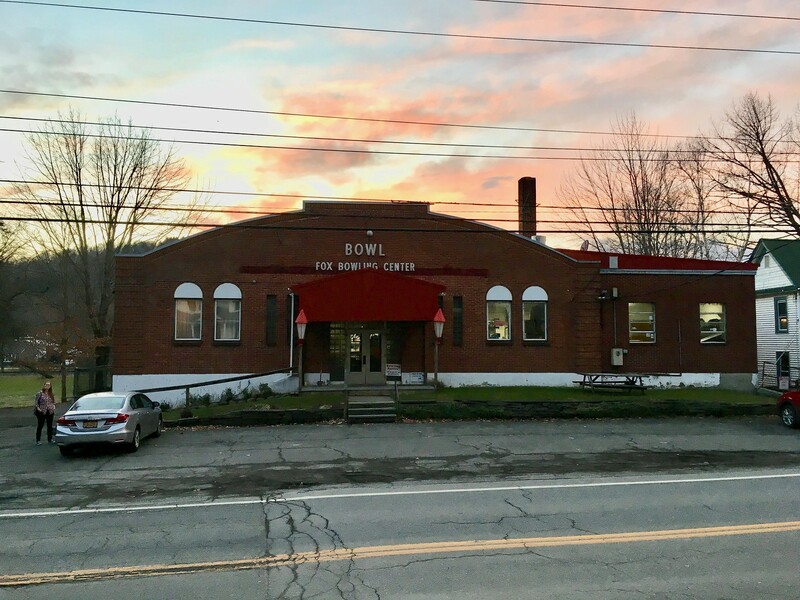 After you receive your helmet from Rocker T Collectibles, send it to me (Paul Lukas, 671 DeGraw St., Brooklyn, NY 11217) or to Phil (Phil Hecken, 142 Main St., Unit 1E, Mineola, NY 11501). If you only want my autograph or Phil’s, please enclose $5 for return shipping; if you want both of us to sign your helmet, please enclose $10, so I can send the helmet to Phil and then he can send it back to you. Also: Once you mail out the helmet, please email me or Phil so we know to watch for it in the mail. The mini-helmets are available here. Incidentally, Rocker T has told me that the ordering deadline to ensure Christmas delivery is Dec. 16. Obviously, you can move that up by at least a week if you want your helmet signed. 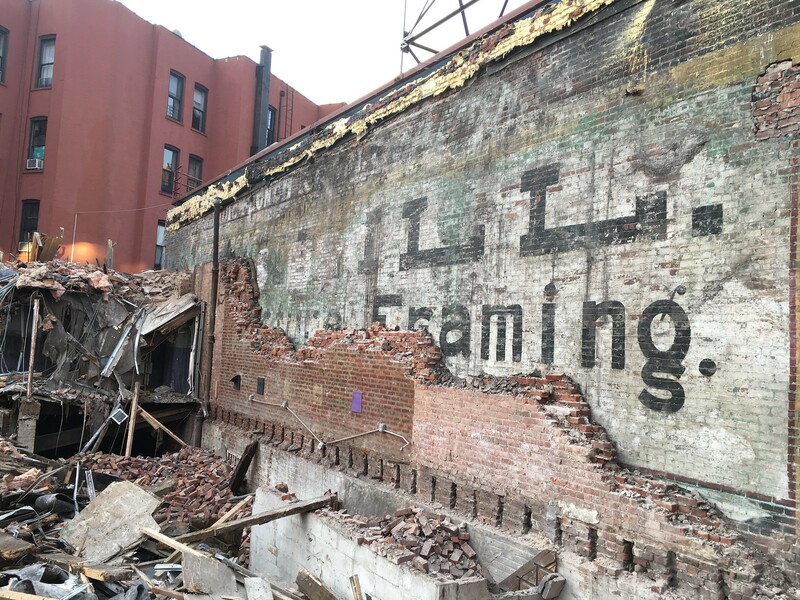 Sign of the long-ago times: The Tugboat Captain and I were walking home from a movie the other day (Lady Bird, really good) when we passed a construction site in my neighborhood where an old ghost sign had been exposed. 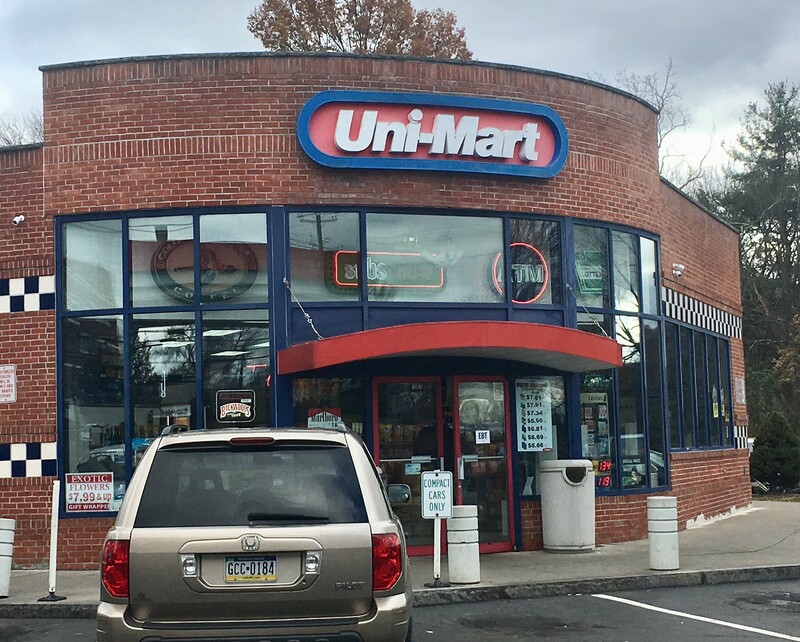 What a beauty — look at that lowercase “g”! 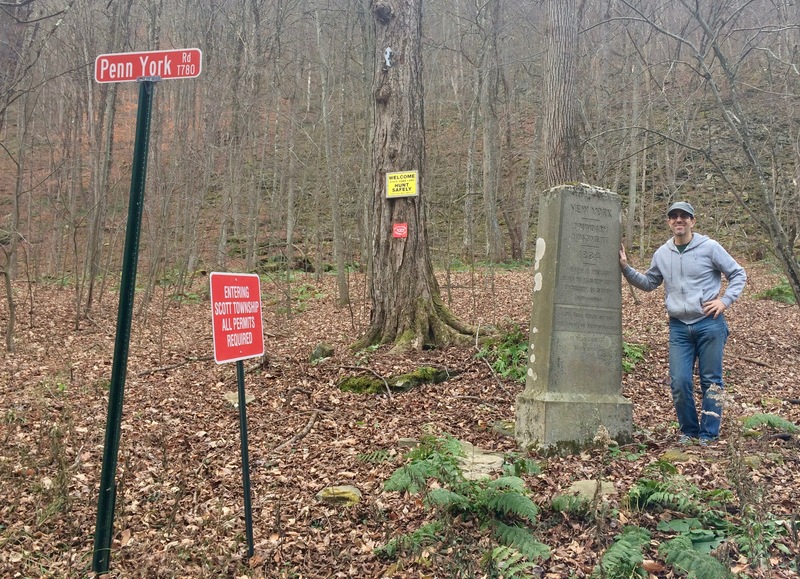 My friend Kevin Walsh, who runs the excellent Forgotten New York site, estimates that the sign is from the 1880s. 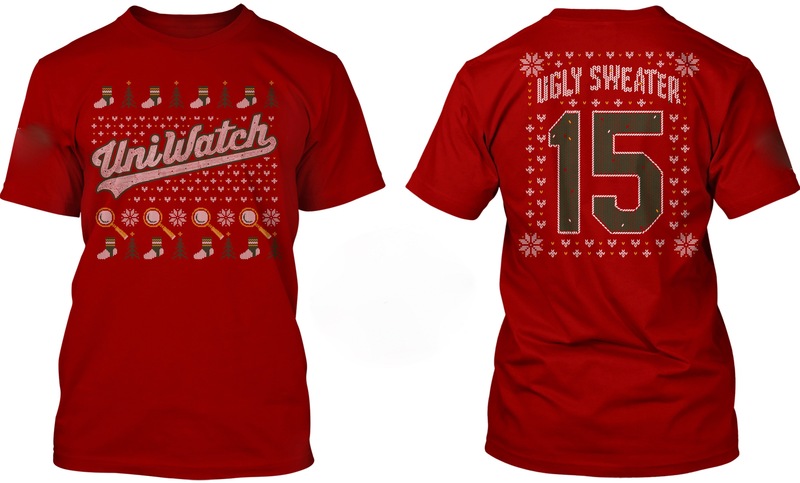 ’Tis the season: With the winter holidays upon us, I’ve reactivated our Ugly Sweater T-shirt. This shirt, designed by Bryan Molloy, was originally the December entry in our original Uni Watch T-Shirt Club series from 2015. I’m reviving it now for the holiday season (but without the sleeve patch graphic that it originally had). It’s a great design concept, with a really satisfying level of detail in the “stitches.” Click on the image at right to see a larger version of the front and back designs — Bryan really nailed it with this one. Baseball News: Great story on how former Mets 1B Eric Campbell mistakenly ended up on Lucas Duda’s 2017 Topps Card. 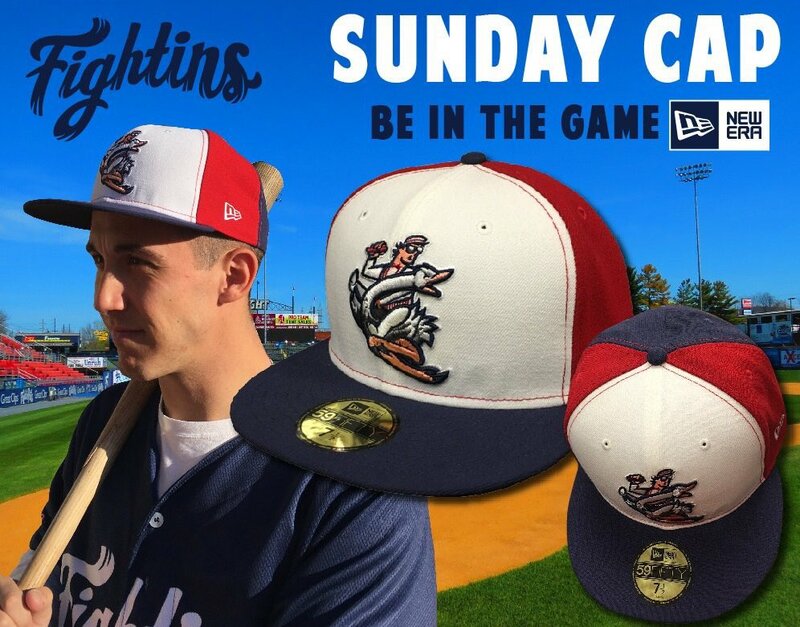 … The Reading Fightin’ Phils will wear a red, white, and blue pinwheel cap on Sundays this season (from Mike Wagner). … Jimmy Lonetti was doing some research and came across a photo of this glove. Was that spike used to inconspicuously doctor a baseball? NFL News: A Bears fan brought a giant Mozilla Firefox logo to Sunday’s game to advocate for the firing of coach John Fox. Get it? (From James Gilbert.) … Here’s a good feature on XTech shoulder pads, which players are rapidly switching to thanks to their unique fit (from Tommy Turner). … The Houston Cowboys? 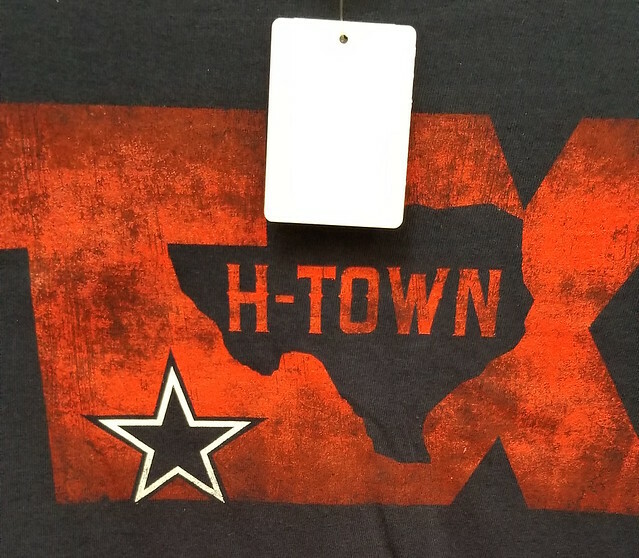 Sean Robbins recently found this shirt while shopping in central Texas. … Riverside City College, a junior college in California, has uniforms that look almost identical to the Bengals’, but with the helmet stripes reversed (from Tris Wykes). 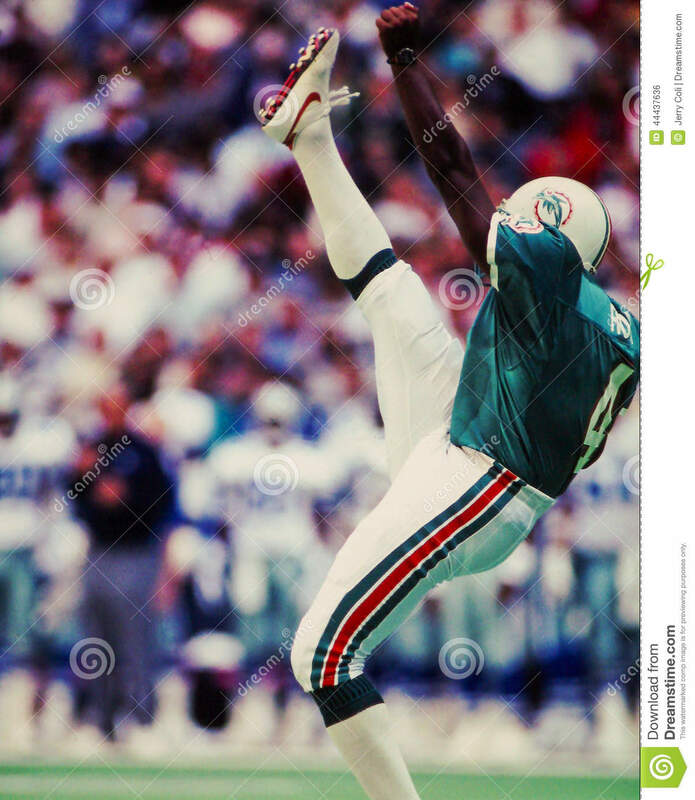 … This has been mentioned before, but for those who weren’t aware: Former punter Reggie Roby used to wear a wrist watch on the field (from Justin). … Vote for the best uni matchup of week 12 here (from Uni Watch Fans). CFL News: Sunday’s Grey Cup between Toronto and Calgary was a fun matchup to watch, thanks to nice contrasting uniforms and a giant snowstorm. 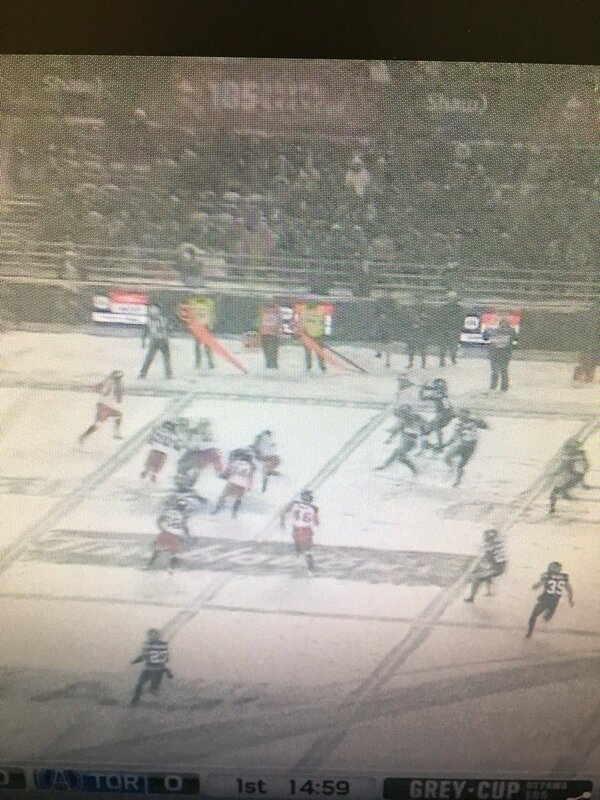 But while most football teams would simply plow lines through the yard markers, the CFL also took time to plow the field ads that had been covered by snow (from Ragnar Danneskjöld)‏. College Football News: Navy will wear Blue Angels-inspired uniforms against Army on Dec. 9. More photos here. 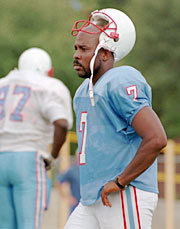 Phil will have a very thorough rundown on this uniform on the day of the game. 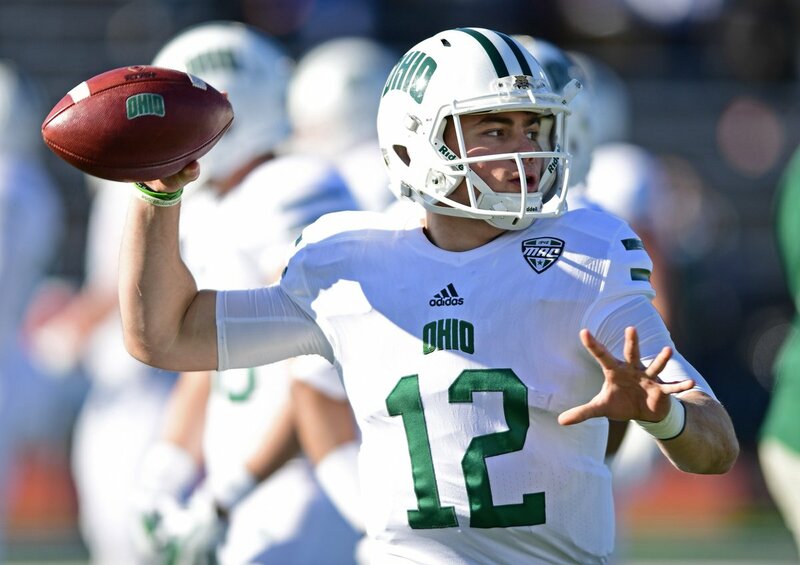 … Ohio wore alternate white jerseys on Friday against Buffalo, including sleeve stripes instead of shoulder hoops (from Jonathon Dies). 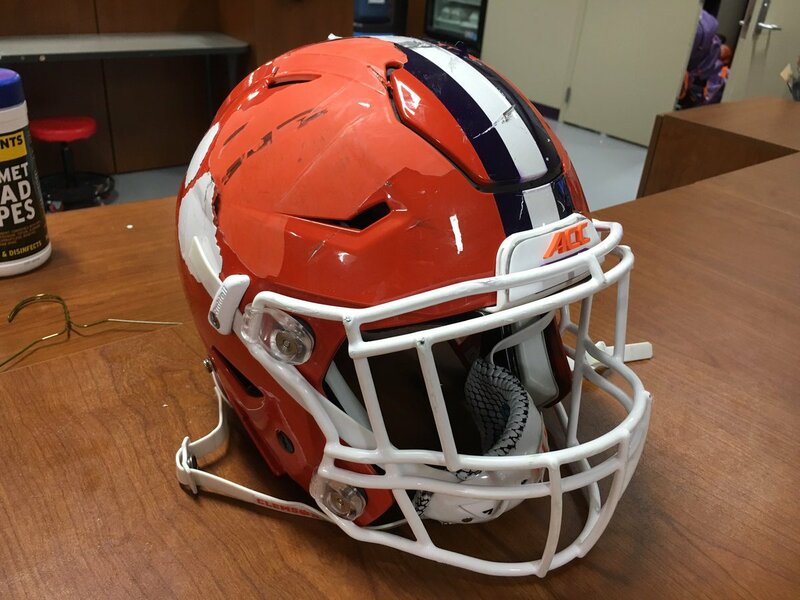 … Clemson LB Jamie Skalski’s helmet took quite a beating this weekend against South Carolina (from Brad Darby and Mark Johnson). … ICYMI from the NFL section: Riverside (Calif.) City College’s uniforms look an awful lot like the Cincinnati Bengals’ unis — down to the striped “B” logo (from Tris Wykes). Soccer News: Remember that silly-looking bust of Cristiano Ronaldo that was unveiled last year? A new sculptor tried again and got it right this time (from Kary Klismet). 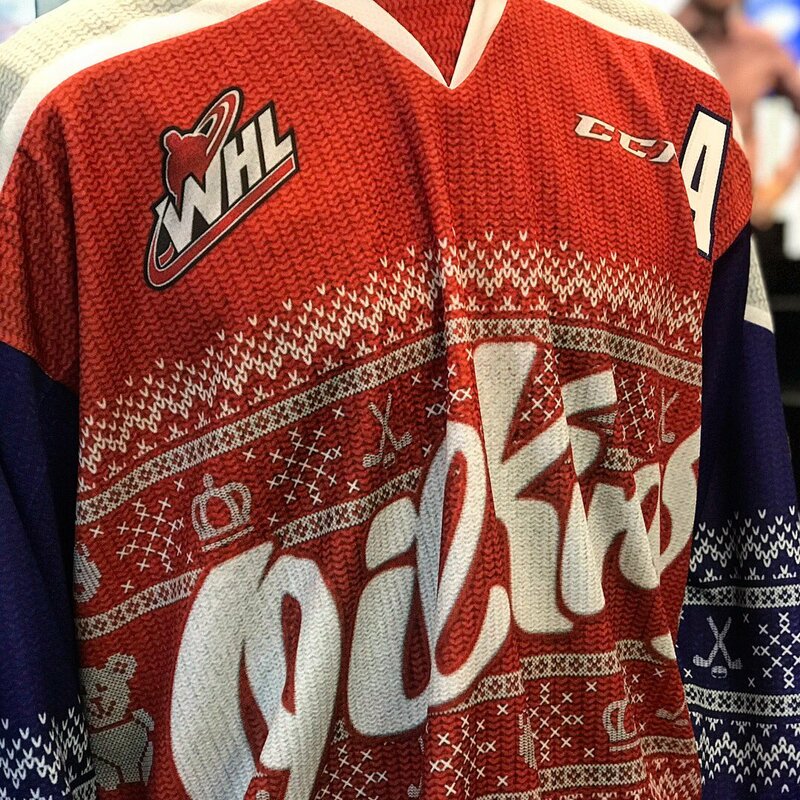 Grab Bag: The Edmonton Oil Kings of the WHL will wear Christmas sweater uniforms on Dec. 2 (from Steven Schapansky). 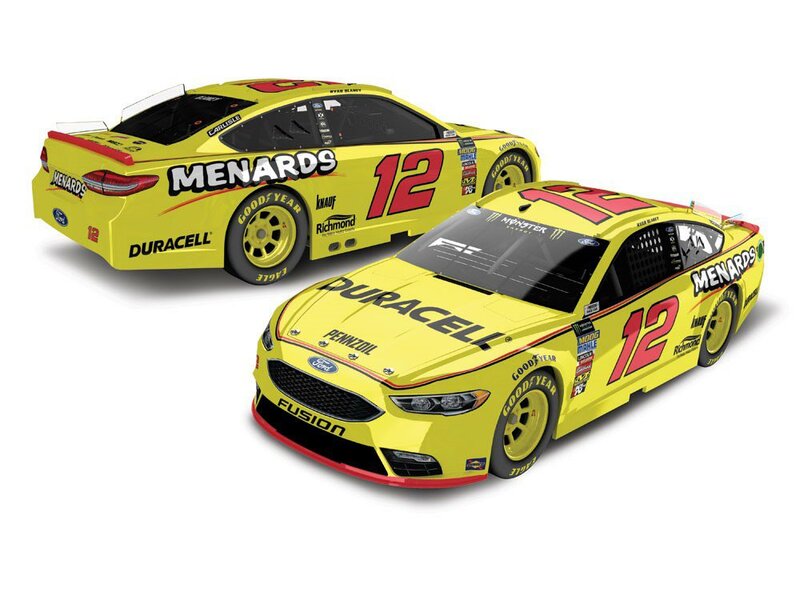 … NASCAR driver Ryan Blaney revealed the paint scheme he’ll use for his car next season (from David Firestone). … Also in racing, Pro Stock Motorcycle racer Joey Gladsone has a new advertiser (also from David Firestone). 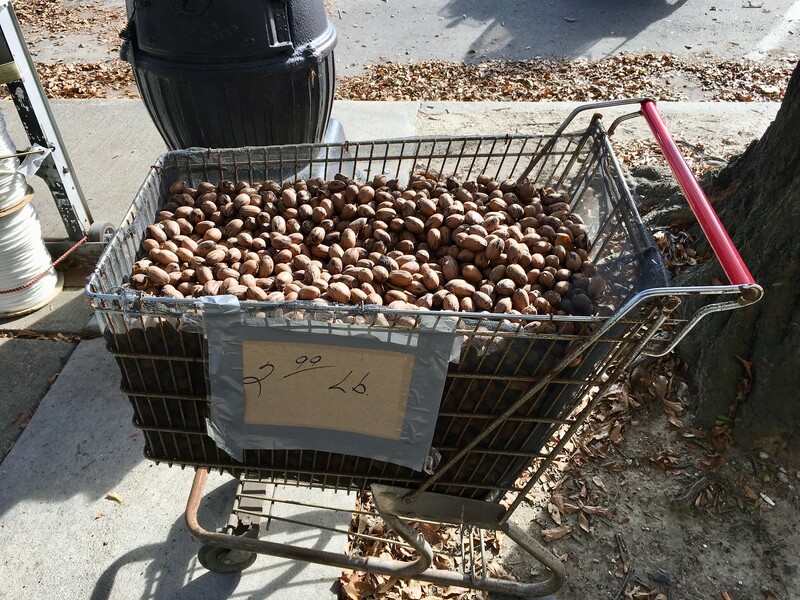 … New Yorkers are likely familiar with Chock Full o’Nuts coffee, a longtime NYC staple. But as the product expands its distribution into new regions, the company recently redesigned its can with a “No Nuts” disclaimer, just to make things clear for new customers who might have been confused by the product name. Broncos did firefox already. That was the Bears. Regarding the NBA shoes and their link to Kinney Shoes. This may be your answer. Yah. 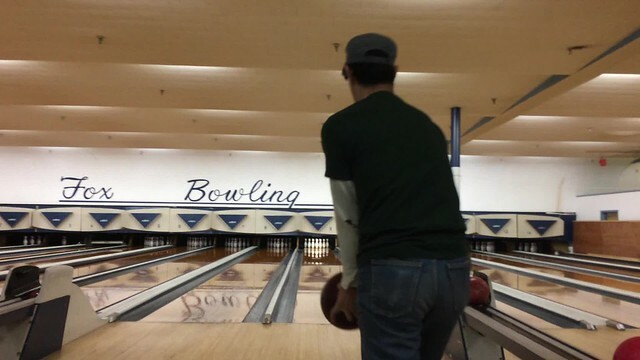 For sure I figured we’d get a strike video! I did indeed pick up the spare! Hickery: noun; Referring to one’s countrifiedness. Larry Bird is very comfortable with his hickery. Cape May Ferry is excellent!!! If you head that way again I would suggest a stop at Cape May Brewery before you board. Also Cape Henlopen State Park on the Delaware side of the ferry is a great place to hike and take in some good views. the new can logo designs at Cape May Brewery are pretty eye catching. Yeah, they did a good job with their rebrand this summer. I especially enjoy the little food logos they put on their cans to show what goes good with the beer. 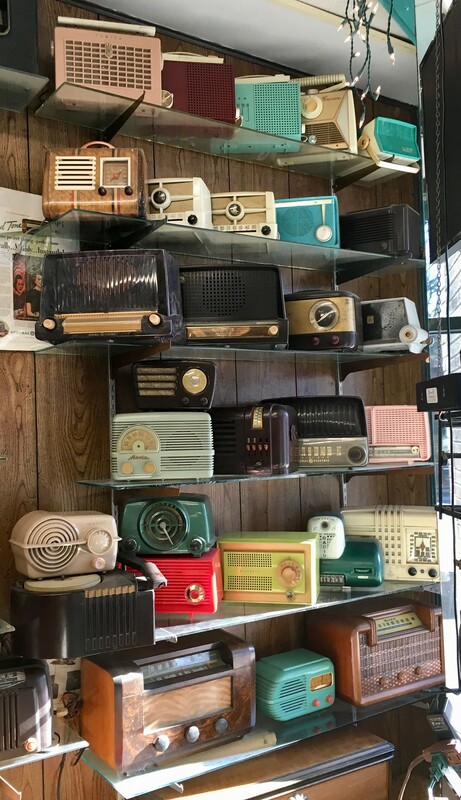 Hot dang, that music shop in Auburn looks super funky. 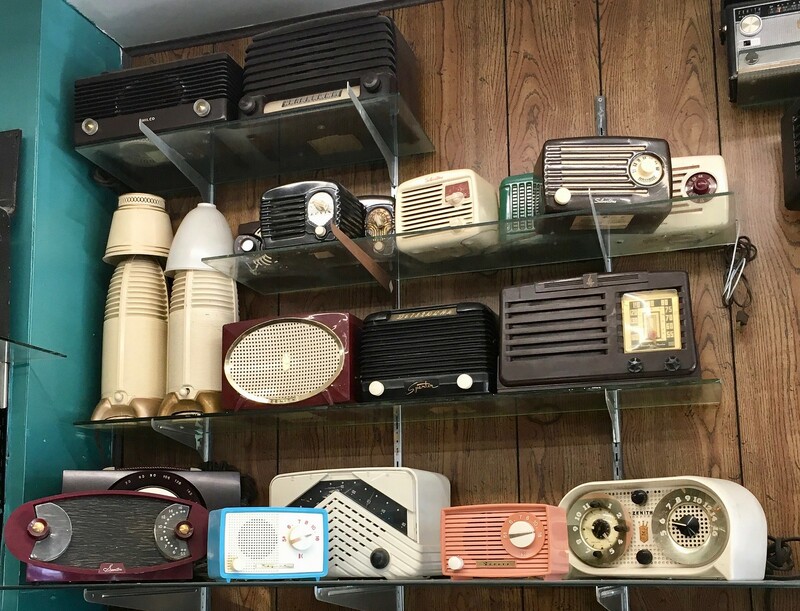 There’s a newish bowling alley out in Rochester that has a “radio wall”, I wonder if that’s where they got the inspiration from. 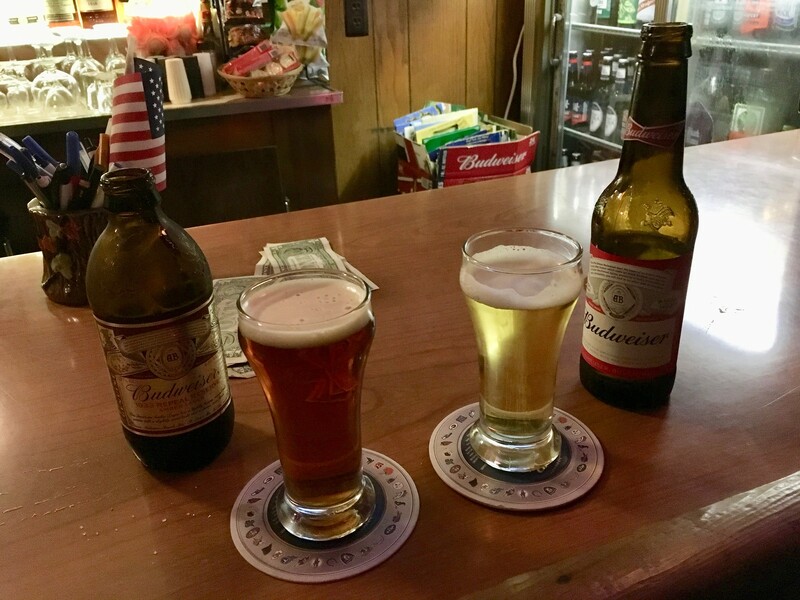 Great travelogue Paul – love all the pics. What a location for “Hunter’s Dinerant”! Navy seems to do a good job with its alternate football uniforms and this Blue Angels uniform doesn’t appear to be any different. I like it. For the Ronaldo story, the second bust was made by a different artist (Navarro Arteaga), not the original one. 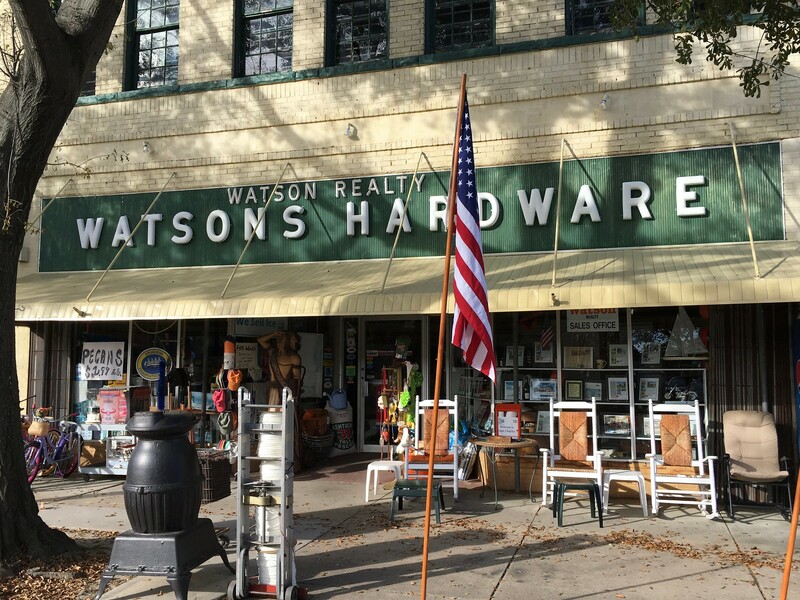 Enjoy reading the travelogues Paul and seeing the cool places you find along the way. Thought of something later in the day to the comments from yesterday. Regarding who would be wearing what as a home team in the upcoming Super Bowl. This season’s Super Bowl is in Minneapolis and the Vikings are looking good. We could see the Vikings playing in white jerseys as the road team in what is normally their home stadium. That is a fascinating detail, Wade! They’d also presumably use the vistors’ locker room and be on the visitors’ side of the field — all in their home building. Assuming they don’t wholesale change the carpet and such, then the home team could be dressing with their opponents logo on the floor/walls? I believe there was some twitter chatter about this in the last week or so and one of the local sports reporters said the Vikings have been assured they would get to use their own locker room and training facilities if they make it to the Super Bowl. Yeah, certainly getting ahead of themselves, especially for the Vikings. Then again, it is not often the Superbowl hosting team finds itself the #2 seed this far into the season. Paul, your travelogue and other non uni-related writing has always been a treat, but for the past year or so it’s been particularly awesome – you’ve got a great voice, and an enviable knack for finding aesthetically interesting places with tasty food, cold lagers, and interesting characters. Hoping Mike’s next project will be to catalogue the travelogues! 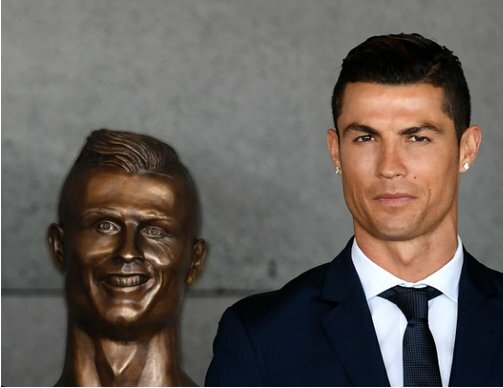 In regards to the Ronaldo bust, based on the article, a different sculptor did the 2nd one. Glad you spent some time in NEPA! I don’t eat hot dogs, but Abe’s is truly a landmark. 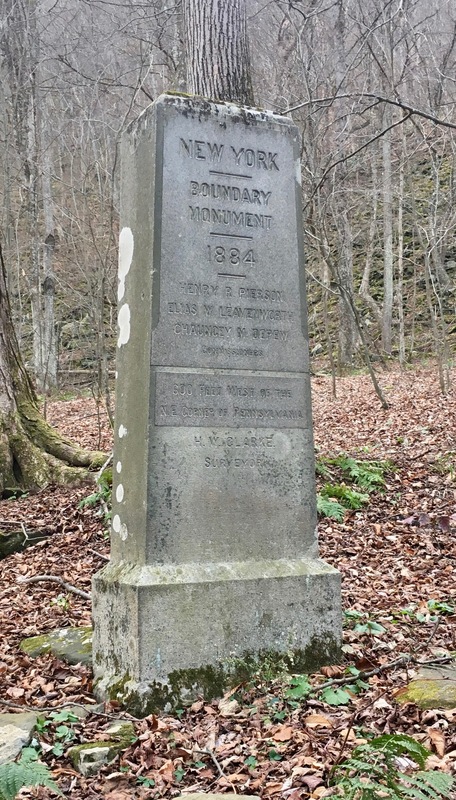 I can’t wait to visit the boundary marker on my next visit home. I appreciate the CFL getting its own Ticker section. I don’t know if this is a new thing or not, but it’s the first time I’ve noticed, and I highly approve. I love Paul’s travelogues too, especially when, as today, he covers ground I know well and enjoy. It’s great to discover Paul’s perspective on a place so well trod as to feel familiar, like the Eastern Shore (or really the whole Delmarva Peninsula). Since we are talking about the Grey Cup and home teams in football championship games, notable that the Toronto Argonauts wore the dark uniforms as the home team in Ottawa. CFL rule is that the home team for the Grey Cup is determined by the division that is hosting it. Keeping with East vs. West tradition and home team always wears dark. Host Ottawa’s team is in the East Division and the Argos were Eastern champs. This rule came into effect about 10 years ago, when it was noted in 2008 that the Eastern champ was the home team for a second consecutive year at the Grey Cup in Montreal. Prior to this, the East and West rotated which team was the home team, regardless of stadium location. Similar to the Super Bowl. Like they were going for an old timey calligraphic g, but just stuck an “s” under an “o”. Talib was not penalized or fined for the incident last year but both players were kicked out of Sunday’s contest and suspended two additional games pending appeal. Gosh those oysters look delicious. Now I need to snag some. The cooked edible parasitic oyster crabs were disturbing. The redneck cleaning his teeth with the live ones, especially disturbing. Thnx, Paul. Kind of reminds me of little fish cleaning the teeth of sharks or birds cleaning the teeth of crocodiles. If the Chargers don’t want to go back to the 60’s Powder’s, go back to the Fouts/Coryell late 70’s/early 80’s colors. 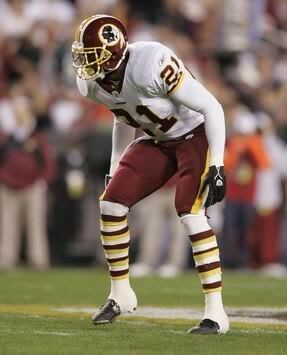 The pants, helmet and jersey were PERFECT. 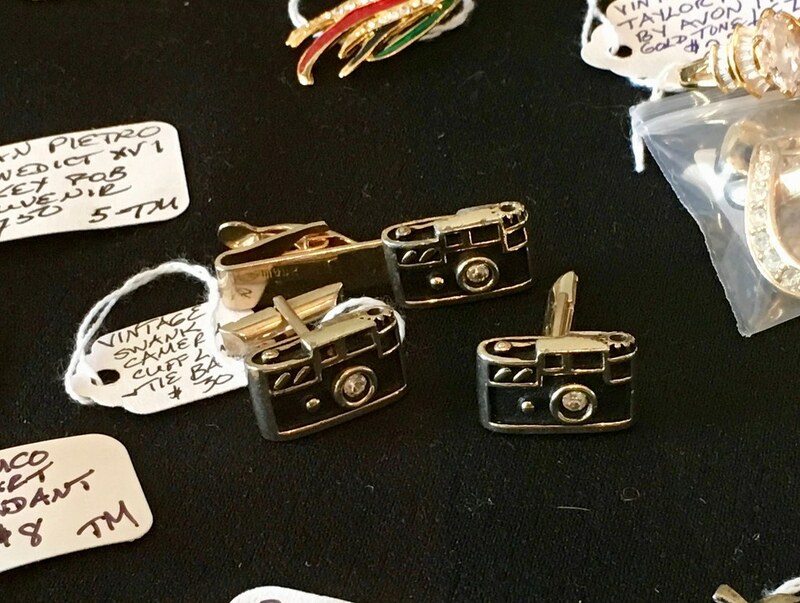 You have a knack for taking interesting pics of ordinary things. If you ever tire of this uni stuff, I recommend a second life as a neighborhood micro blogger. Ha! Thanks, Cole, but trust me, (a) I’m a barely serviceable photographer (I’m very impatient and have a lousy sense of composition, among other deficiencies) and (b) neighborhood micro-blogging will not pay the bills! I love the travelogues, Paul, and I’ll gladly give up a few days of regular content if I know you’re out on another off-the-beaten-path road trip. 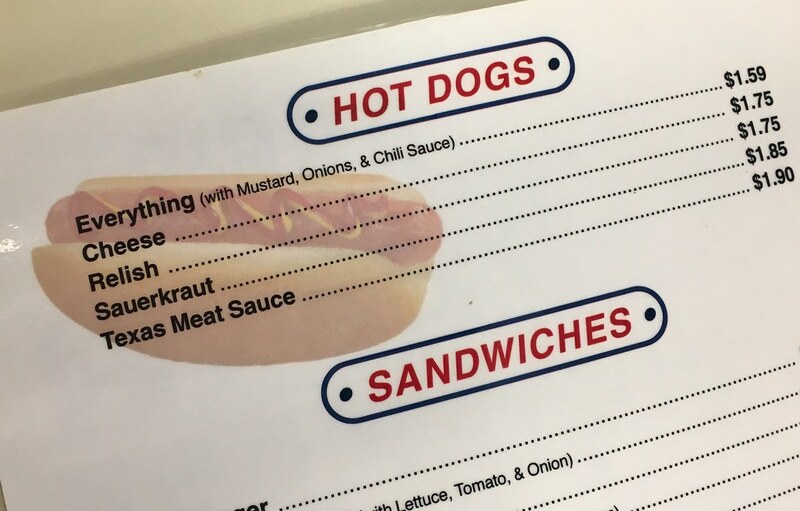 Also “with everything” meaning a few select ingredients: When you order a “burg” with everything at Swenson’s, a fine drive-in burger chain in Ohio, you just get yellow mustard, dill pickles and raw while onion even though there are a dozen other toppings available (http://swensonsdriveins.com/images/menu.pdf). 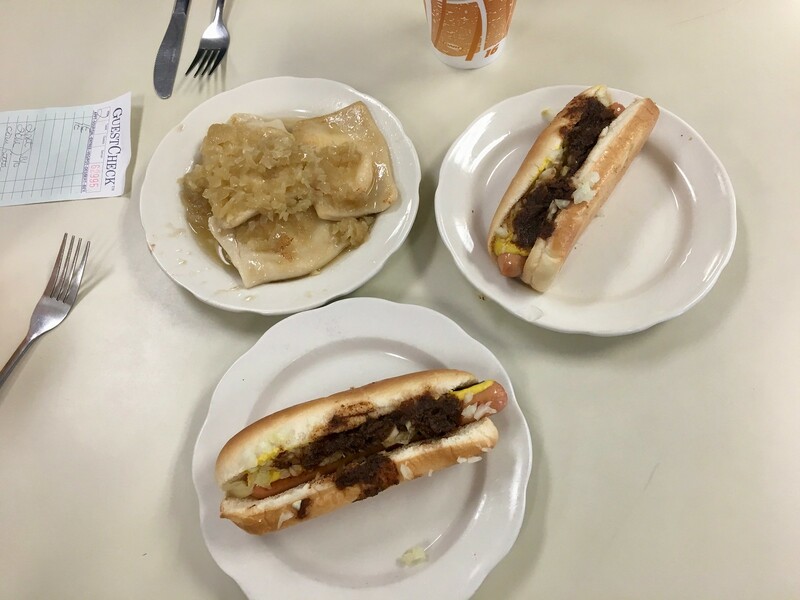 Swenson’s was the first place I went after I got my driver’s license and it’s still a favorite place to visit when I get back to Akron. Going to see The Florida Project tonight, on no small account of your recent shout out. Visiting Bakersfield (I live in California) in a couple weeks, with a certain similarity in mind as your own travels. 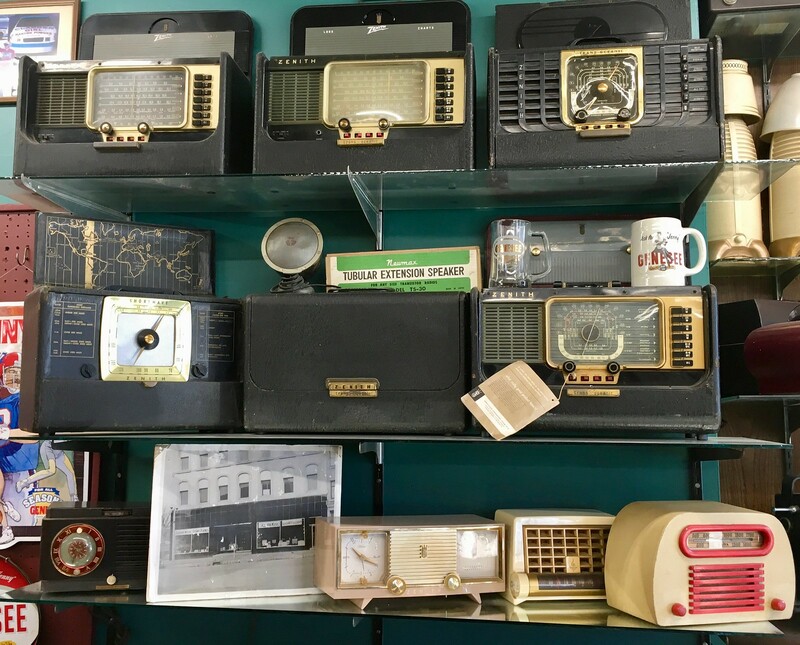 Hope to catch some local music, food and events that seemingly can only be found in small towns that no one else thinks of as a travel destination. Enjoy the movie and the trip, Lee! I enjoy these road trip entries because they show an area of the country I’ve yet to explore, the northeast (mostly)… I’m a huge road tripper myself, a Clark Griswald in the making. But my excursions have mostly been west. Love the “hole in the wall” places too. – see America people, and not from 30,000 feet! And thanks for sharing, Paul. I enjoy the travelogues as do most of the readers here, but I think the reason we do is because you compress sometimes a week of travelling into what it takes us 15 minutes to read about, it makes it somewhat convenient to say you visit cool places, but then most of us forget it might be 4 or 5 hours of driving to get from one place to another. A second thing, a lot of folks say you find the coolest little holes in the wall, but I think in reality, these holes in the wall are very common, and we mostly take them for granted and drive right by when it’s a place we could stop in and appreciate and say, hey, heres an old part of (state/city name) that makes this place cool, and that others should experience before it’s gone. Add in a unique food item or kitschy thing and it makes it all that much better. Thirdly, what I enjoy (ok won’t say enjoy) is when Paul has a less than expected experience. Paul takes 4 days on a road trip, and compresses these neat little places into 15 minutes of our lives and we think it’s great. The trip I recall best about was the Georgia/Louisiana trip from a few years ago when the BBQ was mediocre at best at some of his stops, but he still wrote about the mundane and less than expected experiences of his trip, and I realize as great as these trips seem, there is still a lot of hard work, driving, cost and disappointing experiences along the way. The oyster bake did look interesting and appetizing though. Dude, [IN ONE TRIP] I’ve driven from Indianapolis to Seattle, down the pacific coast highway into San Francisco, back east through Yosemite into the Sierra Nevada Mountains, down into Nevada to Las Vegas, back up through Utah on to Colorado, then Kansas City and back to Indy… IN A CAR! Had a blast with my wife. Along the way, we saw Badlands National Park, Mt. Rushmore, Wall Drug, Devils Tower, Wallace Idaho, Space Needle, The Museum of Flight, Cannon Beach, Golden Gate Park/Bridge, Yosemite National Park/Inspiration Point, Las Vegas Strip, Hoover Dam, Grafton Utah Ghost Town, Zion National Park, Gateway Arch… Call it a sampler of touristy experiences. Was it a lot of driving? YES! But it was well worth it! Cross-country trips are the best. 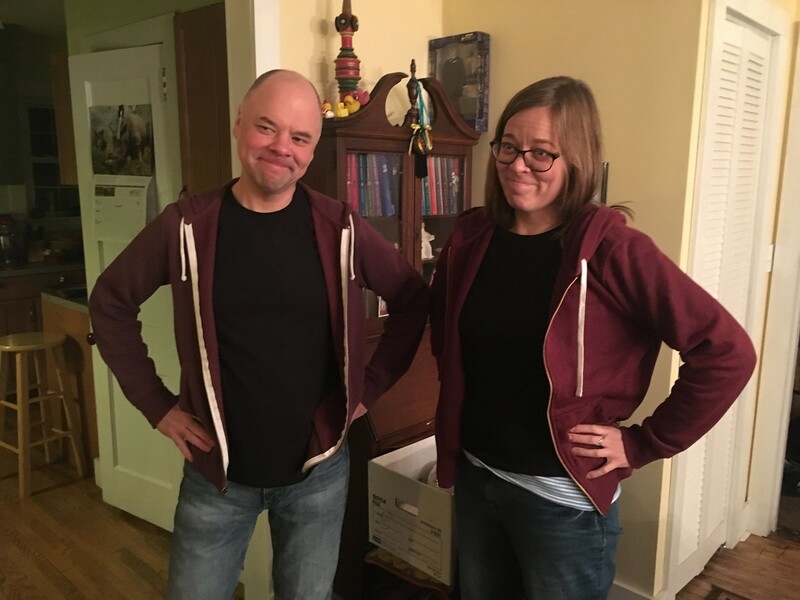 I did it in 1997 with my then-galpal. NYC to Vegas and back. 30 days, about 30 states, I forget how many miles. So good. My favorite non uni stories are like the ones you had today. Oysters just aren’t something that’s in my food chain living here on the plains of North Texas. The way the roast was described with pictures was excellent as usual. We have so many different mini cultures within our big ol’ American culture. I thoroughly enjoyed the article today. Just out of curiosity,can you tell me more about the Texas meat sauce on menu at Abe’s? We don’t have that down here. At least not by that name. I’m surprised no one has mentioned (maybe I missed it somewhere) the fight on Sunday between Crabtree and Alib where Alib ripped Crabtree’s necklace off. 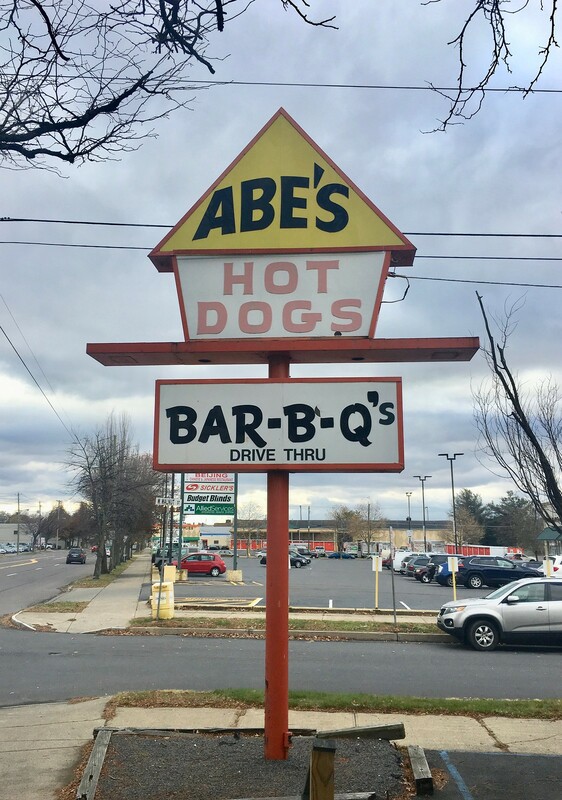 1) the Abe’s you pictured is in Kingston, across the Susquehanna from Wilkes-Barre. 2) Kingston is home of Wyoming Seminary, a high school that is neither in Wyoming nor a Seminary (I worked there for 12 years). When I was softball coach I was able to design new softball uniforms on 2 separate occasions. You’ll be pleased to know that the second time I built in striped stirrup socks! Seeing the Air Coryell stuff is the very definition of bittersweet. Like most San Diego Chargers fans, for me the franchise no longer exists — its remnants are sleeping with the enemy in L.A., playing in a league that no longer wants me as a fan. Think of how Red Sox fans would feel if the team moved to New York. So while I have great memories of the Air Coryell era, seeing stuff like this is a lot like looking into my dad’s open casket. No NBA news? Like the Knicks wearing their new jersey last night? Apparently Alex didn’t realize and nobody notified us. The person doing the Ticker only has one set of eyes! In any case, it appears that you already know the Knicks news, so you didn’t miss anything. When all is said and done, your travelogues are what will really endure. Unique and well-written; everyone who reads along wishes they were there, and your writing puts us right in the picture. Every word is a pleasure. For everyone who has the time, the road beckons! Wow — super-kind of you to say all that, Walter. Thank you!! Thanks for taking the time to share your road trip with us. Just curious, who watches your cat when you are away? I have a friend in the neighborhood. We’ve been cat-sitting for each other for over a decade now! A very good reciprocal relationship. • There is a post next to the Fenwick Is. lighthouse (north of Parksley on the other side of the Bay) that marks the DE/PA border as it was in the late 1700’s. • The reason for the no logos on the NFL model was that it probably wasn’t licensed. I had some old games that had the same thing.